V-CUBE Learning is a learning management system (LMS) that has incorporated the virtual online platform for training and learning purposes. This system enables a trainer to upload and distribute materials of electronic form to the targeted recipients/learners. The materials could be on product knowledge, standard operating procedure, academic assignment, etc. The learners can access to the materials ANYTIME, ANYWHERE with internet coverage.V-CUBE Learning embodies the kind of online training solution that people have always wanted. In other words, BORDERLESS LEARNING is made possible! Conduct educational training programme online with no restrictions on time, location and group size. Get live updates on the progress of your people, understand where they stand and guide them towards success. Result speaks. Find out how well your people are doing and subsequently figure out what your next step should be. Know what your people think about the learning materials and let they tell you how to boost them into high spirits. Create a dynamic learning environment with materials consisting of videos, recordings, documents and more. Tell us the requirements of your ideal LMS, we programme one that fits your specific needs perfectly. 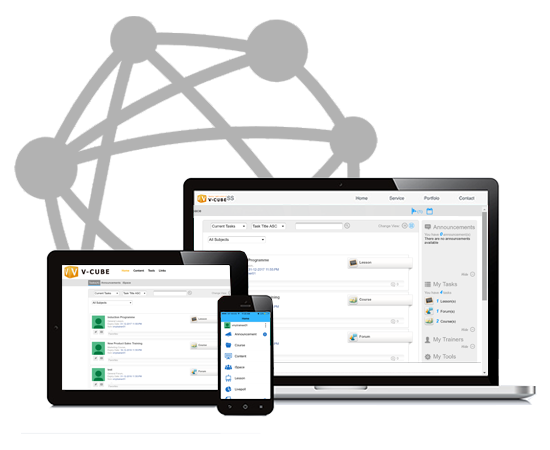 Connect to V-CUBE Meeting or V-CUBE Seminar at ease to manage multiple sites with minimal hassles. Access to V-CUBE Learning through your laptop, desktop, mobile phone, or tablet, experience convenience at its best! Copyright © 2018 V-CUBE Sdn.Bhd. All Rights Reserved.